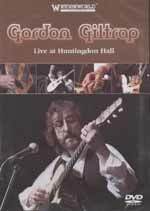 Live at Huntingdon Hall was the first performance DVD released by Gordon Giltrap, 26 Tracks plus out-takes and extra footage. It includes several duets with classical guitarist Raymond Burley, his partner in "Double Vision,"
In 2006 it was reissued with a new cover. For more info see the article about Huntingdon Hall in the Major Concerts Section on the News page. Video Cameras: Ewan Hunter and his team.